For patients with extensive pressure relief requirements, the use of an underlay mattress may be necessary in addition to their existing pressure relief system. 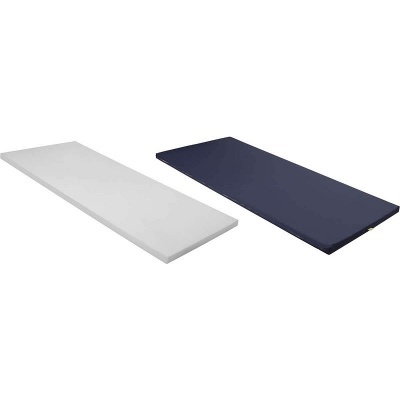 The Harvest 50mm Underlay Mattress is designed specifically for this purpose, meant to be placed underneath a patient's pressure relief mattress system directly on the bed base. This underlay mattress is available in two versions, white and chip foam, both with a height of 50mm. Choose the appropriate version from the drop-down menu above. With a depth of only 50mm, this underlay mattress is perfect for situations where carers wish to reduce the height of their patient's bed. This reduced height means that patients will be at a lesser risk of injury in the event of a fall from their bed. Perfect for use with Harvest Low Profiling Beds and Crash Mats, this underlay system can help to bolster safety for patients at risk of bed falls. When it comes to caring for foam cushions and mats, both protection and breathability are crucial. The cover supplied as standard is waterproof, ensuring that no fluids or spills will cause long term damage to your mat. In order to maintain the bounce-back and shape of the foam over time, the cover is vapour permeable, allowing for air to freely pass through the area between the mat and active mattress.